The 5 wives are also referred to as Immortan Joe’s prime breeders. Bandeau bra (cotton knit), loincloth (cotton knit), body wrap (cotton voile, bubble gauze or muslin). She is barefoot, pregnant and in her third trimester. She experiences contractions while hiding in the War Rig. Boat neck long-sleeves cutoff top, with strands from behind criss-crossing her back and then tying together in front (cotton knit). Loincloth (cotton knit). Barefoot. Bandeau bra (cotton knit), loincloth (cotton knit), tall Doc Marten boots. 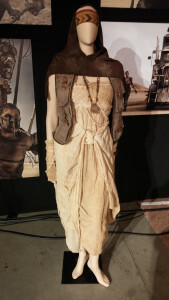 She is wearing some kind of thin scarf with 2 long ties around her neck, an arm wrap on her left arm, and it appears she has two jawbone ornaments hanging from strings that are braided into her hair. Bandeau bra (cotton knit), loincloth (cotton knit). Barefoot. After meeting the Vuvalini, she is adorned in a colorful chevron-pattern headband, a simple hood, necklace, and vest. Halter bandeau bra (cotton knit), loincloth (cotton knit), and a wrap skirt that has decorative pintucks sewn into it (cotton voile). Dark brown suede gauntlet/wrist-warmer on her right hand. She is wearing primitive, lace-up pointed-toe leather shoes. The closest I was able to find are here. Later, she wears brown goggles, which are French-made 4602 aviator goggles. They are not inexpensive. The best deal at the time of this writing can be found here. After meeting the Vuvalini, she receives an ethnic embroidered blanket.